The best toilet brush for the home is the OXO Toilet Brush and Canister. The auto open/close canister allows for touch free operation and the integrated drip tray prevents mold growth. The compact canister design fits in tight spaces and tucks away nicely in the corner. Pair this with a secure grip ergonomic handle and replaceable scrub head and you have the best toilet brush and canister on the market. Why Is the OXO Toilet Brush and Canister the Best? The OXO Toilet Brush and Canister is extremely easy to use. Lifting the brush handle will automatically open up the canister and allow the brush to be picked up. You never have to touch the canister or the brush head itself. The sleek design footprint of the canister that houses the brush is small and doesn’t overpower the bathroom decor. It sits in the neatly tucked away canister next to the toilet. When using the OXO Toilet Brush, you will find that it’s amazingly simple to use with the tapered brush head for hard to reach places in your toilet bowl. The OXO Toilet Brush has dual-action bristles for those serious scrubbing jobs that require a bit more elbow grease and will not wear down like other brushes do. Many of them do not last more than a couple of cleanings and you can see the flattened bristles. When the bristles are flattened, you will find they do not clean your toilet bowl effectively. If you wonder what happens to the brush once you put it back into it’s canister, no worries there either. 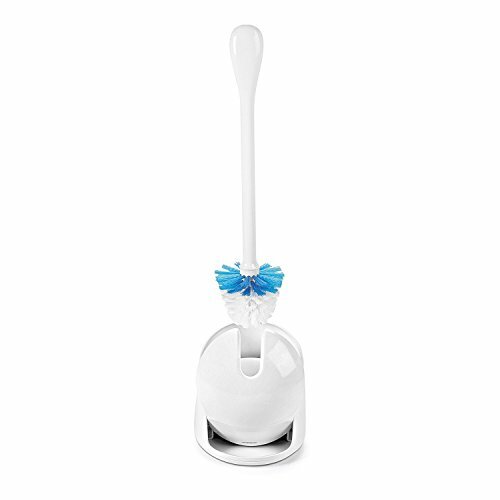 The OXO Toilet Brush and Canister has a drip tray with ventilation slots for quick drying so the water from the bristles can drip and evaporate from the canister. They have thought of it all! Ever seen a toilet bowl brush canister that molds because it holds excess water on the brush? You will find the OXO Toilet Brush completely sanitary and free of moldy situations. Who Can Use the OXO Toilet Brush and Canister? The OXO Toilet Brush and Canister Set can be used in any personal home but I would certainly recommend this be used for professional cleaning companies as well. This brush is more durable than other brushes as it can withstand multiple cleanings and daily wear. The bristles are held on with stainless steel staples which makes it much more durable than competitor’s products. Another benefit to the auto open and close OXO Toilet Brush and Canister set is you never have to touch the brush. This keeps cleaning more sanitary and is a huge plus for anyone cleaning these areas. These toilet brushes are small enough to put into an apartment size space. No large spaces required. Who wants to see a huge toilet brush sitting out? Because they are sleek and compact I would definitely purchase this OXO Toilet Brush and Canister set. One of the best features about the OXO Toilet Brush and Canister is you do not have to throw away the entire brush when it has finally seen better days. When you are ready, the brush head can simply be replaced. You maintain the canister and the handle. The handle is comfortable to use with a secure grip for scrubbing. The tapered brush head and longer handle is good for hard to reach places in your toilet bowl, especially under the lip of the bowl. By using this brush it will cut your scrubbing time down to a minimum. The best design features of the OXO Toilet Brush and Canister are the automatic open and close canister, compact design for all spaces, brush head replacement and quick drying tray allows for water evaporation instead of mold building up in the canister. There are 4 colors you can choose from when ordering and it is reasonably priced. Purchase the highly recommended OXO Toilet Brush and Canister set and you will not fret over bathroom cleanings ever again.